FS-Curtis FAC Series box type, portable diesel air compressors are designed for mounting in confined spaces such as on service trucks. 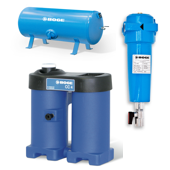 The box type units are ideal for stationary applications. Access is only required to one side for routine maintenance. The all-steel cabinets are lockable, silenced and weatherproof. 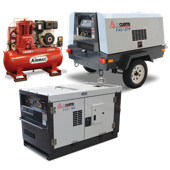 The FAC Series from FS-Curtis comprises a range of heavy duty, portable diesel air compressors offering superior efficiency, quality and reliability in an environmentally responsible manner. Each model's fuel consumption and noise emission levels are amongst the best in class. There is a wide selection of 34 models including box and trailer type configurations, continuous duty outputs from 1.2 to 36 m3/min (55 to 1,300 cfm), and working pressures from 7 to 24 bar (100 to 350 psi). 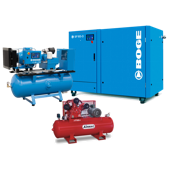 A factory installed aftercooler option is available for most of the 7 bar compressors. All models are based on well proven designs that are market leaders in their home territory of Japan and widely distributed throughout the rest of the world. Thousands of these units are already working under the most demanding conditions in construction, mining and industrial applications. With a comprehensive array of standard features, the FAC Series compressors represent outstanding value for money in capital investment terms. And their high levels of fuel efficiency and reliability deliver whole-of-life operating costs that are amongst the lowest available.